Dn. Stephanos Ritsi, son of Father Martin & Presvytera Renee, grew up in the mission field (Kenya and Albania). Upon returning to the United States, the Ritsi family moved to Saint Augustine, Florida. Dn. Stephanos attended High School in Saint Augustine. He then received his BA in Political Science from the University of Florida (Go Gators). In 2006, Dn. Stephanos went on a Short Term Missions team to Kenya. On this trip he realized that he was called to become a long term missionary. He applied to Holy Cross School of Theology to prepare himself for missionary service and graduated with a Masters of Divinity and a certificate in Missions and Ecumenism from the Boston Theological Institute. Dkn. Alexandria Ritsi, daughter of Louis and Valerie Polychronopoulos, grew up in a south suburb of Chicago and attended Sts. Constantine and Helen Greek Orthodox Church in Palos Hills. She grew up in Chicago and was very active in her Church community and youth groups. Growing up, Dkn. Alexandria knew she wanted to serve the Church and to be a teacher. Dkn. Alexandria went to Hellenic College and there she learned about the missionary ethos of the Orthodox Church. Through experience in classes in missiology offered at Hellenic College, Dkn. Alexandria realized her vocation in becoming a missionary. Dn. Stephanos and Dkn. Alexandria met at Holy Cross/Hellenic College in 2008. Dn. Stephanos and Dkn. Alexandria were engaged in Yosemite, California in 2009 and married in Saint Augustine, Florida in 2010. While at seminary, Ritsi's led the missions committee of the school. They also were active in teaching Sunday School, leading retreats, and serving under longtime missionary Fr. Luke Veronis at his Parish of Sts. Constantine and Helen in Webster, Massachusetts. The Ritsi's graduated from HCHC in 2012 and were deployed to Albania in April of 2013. Albania is a country that has faced many challenges throughout its history. The greatest challenge it faced was its war on religion during the reign of Enver Hoxha, a communist dictator who led Albania to become the only country in the world to constitutionally outlaw religion! The results of the systematic attack on religion and faith are still echoing through the country. The Ritsi Family, together with local leadership and other Orthodox missionaries, is working to share the message of the Gospel in the country of Albania. Dn. Stephanos serves as first Deacon at the Resurrection of Christ Cathedral in Tirana. He also teaches Missiology at the Resurrection of Christ Seminary in Durres, helps in the office of the Archbishop and is working on his Doctoral Thesis in Homiletics at Aristotle University in Thessaloniki. Dkn. Alexandria teaches English at Logos University, works at the Protagonist School teaching English where she also leads a group within the Spiritual Journey Catechism program, is one of the Church photographers, and has a radio show on Radio Ngjallja. 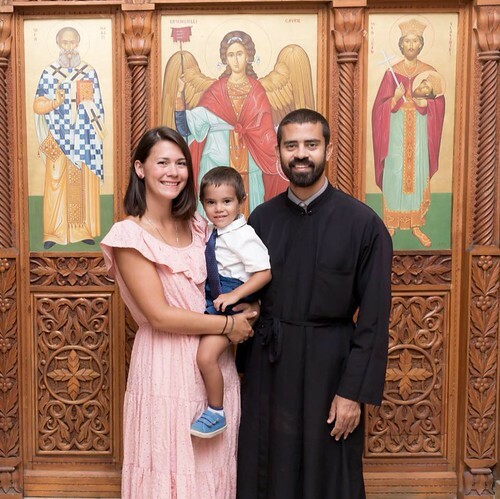 In April of 2015, they welcomed their son, Moses Anastasios who loves Church and is learning both English and Albanian. Through your prayers and support we are working to inspire and train disciples and leaders here in this country and we look forward to many years serving our Lord and God in Albania.